The winter farmer's market still has plenty to offer! Assumptions. I know better than to make them, yet I still do. In my mind, the winter farmer’s market was a place of leftover collard greens, cabbage and sweet potatoes. Sad. Lonely. Bereft of good eats. I should just give up and head to the grocery store, right? Wrong! I decided to check my assumptions at the door and visit the State Farmer’s Market on my lunch hour yesterday. I am so glad I did! Not only was the State Farmer’s Market busy, but I was really amazed at the variety of fresh vegetables and fruit (apples) that were still available. Thanks to a very mild winter (at least in NC), farmers are still growing and harvesting white potatoes, sweet potatoes, tomatoes (mostly locally grown hothouse), salad greens, turnips, kale, spinach, green peppers, apples, fresh beans, broccoli, collard greens, beets and more. And the prices were definitely lower than the grocery stores on just about everything. I was glad to find Scott Smith of Heaven On Earth organic farm at the market. He was awesome! He and his wife have a farm outside of Wilmington and they love organic farming. Farmer Scott let me taste test my way though his vegetable stand so I could discover the difference between dino kale and curly kale (dino kale is thicker and spicier), how turnip greens with a little bit of yellow (from frost) are sweeter than the bright green leaves (the frost brings the sugar to the tips of the leaves) and more. In the end, I did buy vegetables, including the dino kale (the name alone makes it interesting). Scott suggested that the dino kale makes terrific kale chips, something I had heard of, but hadn’t tried before. OH. MY. GOODNESS. They were devoured by my family and my pre-teen daughter (who eats vegetables grudgingly) decided they were amazing. Light, crispy and salty, these are the perfect antitode to potato chips. The recipe is below. Kale Chips! Crunchy little antioxidant chips--howgreatisthat? Cut off the lower woody stems and compost. Cut the kale into pieces about the size of potato chips (2-4″ or so). In a bowl (or a plastic bag, if you don’t want your hands oily) put the chopped kale and add 1 Tbsp of the olive oil. Toss the greens with the oil until leaves are covered. (If you use the bag, massage the bag until the leaves are covered). Add the vinegar and toss again to coat. If needed, add the remaining Tbsp. olive oil (depending on the thickness of the leaves, you might not need this). Carefull place leaves on an oven safe baking rack or on a cookie sheet (I used a rack). Don’t overlap leaves. Remove from oven and enjoy immediately! Next post, local meat producers at the farmer’s market! Although the area of North Carolina where we live is primarily high-tech and business/government oriented, most of our state remains agricultural. It makes me happy that I can drive 20 minutes outside of Cary and find family run farms that still produce vegetables and livestock. 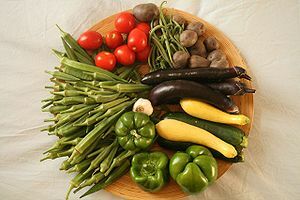 In fact, North Carolina is a primary regional producer of sweet potatoes, strawberries, peaches, corn and tomatoes. North Carolina is also home to two regional grocery store chains–Lowe’s Foods and Harris Teeter. It’s not a huge leap to think that our NC grocery stores would carry NC products, right? With our new dietary challenges in mind, I recently visited our local Lowe’s Foods grocery store to see if in fact I could find locally produced vegetables, meat and agricultural products. I was hoping to find that I could purchase at least some local food products at my local grocery. As I wandered through the produce section I wondered why Lowes sells collard greens from South Carolina when we produce them here? Same for sweet potatoes. In the produce aisle, I did not find one item produced in our state, but I found several produced in Mexico or Peru. I gave up on the meat section, which has no source information at all. I did find some agricultural products (grits, corn meal) and processed food products (barbecue sauce, hot sauce), but other than that, I came up empty-handed. So, I asked a Lowes employee who looked official (wearing a tie and carrying a clipboard), why that is. He explained that the company as a whole has contracts with specific producers that ensure they have a “good selection at an affordable price.” So where do all the products we produce go? He also mentioned that some stores, including one in a nearby town, have displays of locally produced products, but that the manager of my particular Lowes had not chosen to do that. Then, very interestingly, he also mentioned that his family doesn’t buy their vegetables at Lowes or any other grocery store. They use a produce co-op hybrid called The Produce Box, which sources only from NC farms that use sustainable and/or organic farming practices. Hmmmm. Curious.